How was it that Goans came to have a virtual monopoly as clerks and accountants In Kenya and the other colonial governments of East Africa? Goa at that time was a Portuguese colony, not part of British India. Why did the Colonial Services recruit Goans and not Indians? The links with India, and especially the Indian Civil Service, were important in the development of the British East African colonies. This exceptionally well researched book, sponsored by the Heritage Lottery Fund, explains the reasons for the growth of the Goan community in East Africa. The story begins in Zanzibar. In 1865 a young Goan, Caetano do Rozario de Souza, arrived and set up a store. Several others followed and set up family businesses there. From the beginning, the Goan stores chose to be different from Indian dukas. They were airy and clean and stocked a range of goods - tinned foods, wines, tobacco, tailored clothes, shoes and books - attractive to Europeans. De Souza was the most successful and his store grew to become a bar where Europeans gathered to drink and meet as a club. He was also favoured by the Sultan, Sayyid Barghash, who awarded him a gold medal for enterprise. Zanzibar was at that time the centre for European interest in East Africa. Consuls General, the Royal Navy, explorers, missionaries and prospective settlers used Zanzibar as their base. It was the capital of the Sultanate that had come to control the East African coast from Mogadishu to Lourenco Marques. Britain, Portugal, Germany and Italy were all beginning to scramble for territory in the unknown hinterland. Goans rapidly acquired a dominant position in Zanzibar in the trade that this European interest generated. They became ship's chandlers, and suppliers to expeditions. By 1881 there were 173 Goans in Zanzibar engaged as storekeepers, tailors, cobblers, bakers, pharmacists, and photographers. Some of the Sultan's personal staff were Goans too, as clerks, interpreters and even as close advisers; they even held the posts of Collector of Revenue, Postmaster, Bandmaster and Director of the Land Department. The manager of the Zanzibar Gazette, the Sultan's mouthpiece, was a Goan. A close relationship also developed between the Goan community and Sir John Kirk, the long serving British Consul General who had the ear of the Sultan. As there was no Portuguese Consul General and they were Portuguese citizens the Goans relied on him for support and protection in the courts. These Goans came from educated middle class families in Goa where the caste system was typically Indian. Overlaying that system was the Portuguese ruling class dating back to the 16th century when Goa became a Portuguese colony. Intermarriage over the years had produced a society and a culture where pale skin implied higher class; "assimilado" meant not looking down on half castes but regard for a family which had been well educated, become Christian and made it into Portuguese society. In Goa there was a University, a Catholic Seminary and a Medical School set up by the Portuguese colonial administration. As a result of the success of Goan professionals in Zanzibar, the Imperial British East Africa Company based in Mombasa also looked to Goa for clerical staff for their growing business and appointed an agent In Bombay to recruit them. Mombasa was growing rapidly in the 1890's under the IBEAC. By 1885 there were over 100 Europeans and 170 Goans living there. As in Zanzibar, Goan traders were catering especially for the needs of Europeans. When the Uganda Railway opened in 1901 many of the station masters, guards, clerks and some of the drivers too were Goan. As Nairobi, the new capital, began to grow the number of Goans there too Increased both In business and in government service. The Goan Institute was founded in 1906 and soon had a fine building with club facilities for sports, music and social life. But the Goans kept out of politics; in the 1920's and 1930's they distanced themselves from the political campaign of the Indian community to acquire the right to buy land in the "White Highlands" and the franchise granted to the White Settlers. That campaign did not succeed and as segregation between Europeans and Asians became more entrenched the Goans tacitly accepted the situation both in government service and in urban planning. But while they resented being shut out of white institutions they supported the segregation of Asians and Africans. They viewed Africans at that time with the same disdain as many whites did and doubted their ability to progress into the skilled professions. Their class consciousness in terms of colour within their own community was magnified into a conviction that the gulf between themselves and Africans could not be bridged. This issue came to a head In the 1930's over government education policy. Education had been the key to their success in government service and had been based on good Catholic mission schools in Goa. In Nairobi there was a long battle between the Goan Institute and the French Catholic Mission over the opening of a school for Goans. The Goan community feared that the Mission would insist on Goan children being taught alongside Africans. Eventually, thanks to the intervention of the Governor, the Mission agreed that the school would be restricted to Europeans, Goans and other Asian Christians. Segregation was also institutionalised by the way in which the Colonial Service in East Africa was structured in three grades - European, Asian and African, with separate pay scales, conditions of service and standards of housing. While resentful of the favours to Europeans, the Goans realised that their clerical jobs were protected by the separate Aslan pay scale - Europeans would not apply for them and if Africans were allowed to compete for them they might drag the salaries down. These distinctions continued until the rush to independence caused the colonial government to bring in a rapid Africanisatlon programme. The Africanisatlon of senior posts meant that some Goans missed out on promotion but they did remain for a few years after independence secure in the senior clerical jobs where their expertise could not be dispensed with. Then in 1966 President Kenyatta's government decided to Africanise the clerical posts too. The compensation included six months paid leave and free passages to Goa or to the UK. Most Goans accepted the offer and many decided to come to the UK. So began a new chapter in the history of the Goan diaspora. Some joined the UK civil service in Whitehall or in the provinces where their previous experience in Kenya government service gave them good leads; others opened shops or started small businesses, networking through friends and relatives in the UK. In 1966 they formed the Goan Overseas Association in the UK which eventually led to the acquisition of a club house and playing fields at Ravensbourne in Kent. It was burnt down in 1998, probably in a racist arson attack and not rebuilt. The Goan Association, however, lives on and produces The Goan Voice, a daily online newsletter, summarising news about Goa and the Goan community world wide. World Goa Day started in the year 2000, is an annual event on 20th August celebrated and coordinated by Goan Associations in many countries. 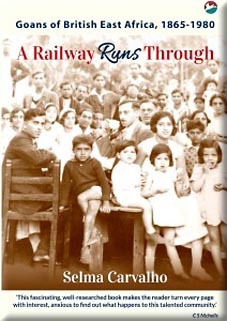 This book by Selma Carvalho, meticulously edited by Kenya author Christine Nicholls, is a well deserved tribute to the Goan community who lived and worked for two generations in East Africa. Those in government service helped to build the economies in five British colonies - Kenya, Uganda, Tanganyika, Zanzibar and Nyasaland - during an era when the colonial governments could not have functioned without them. (This review has concentrated on Kenya, but there are good chapters on both Uganda and Tanganyika in the book). All of us who served In East Africa will know what a contribution the Goans made, whether serving as clerks and cashiers in remote bomas or as staff in the secretariat and headquarters of large departments. Their competence, integrity and uncomplaining attitude, often in arduous conditions, made them colleagues of exceptional value.